It was Roger’s birthday on Sunday and we popped round in the morning with a present. It’s not easy to get him to accept a gift: in the past I have managed an enamelled coffee pot to replace his, which had sprung a leak, and once I made him a new red flag with which he could warn traffic when he was bringing his cows home for milking and needed to get them across the road. This year it was Markus who had the perfect idea. Roger’s transistor radio had got stuck on the wrong station and, in order for him to hear the Mass which is broadcast on Sundays by the local radio station, he was obliged to go outside to sit in his van and listen on the car radio. He has been doing this for some months now, all through the bitter cold of February, and Markus decided it was time to recycle our portable radio. Roger was (discretely) pleased with his gift, and after the regulation pastis we said goodbye – he was off to lunch at his cousin’s. As we scrambled down the short cut over the bank we realised that a group of about a dozen people were milling about interestedly in the courtyard. It was a family, en route for a get-together in Empurany, involving more than a hundred people, and this group had stopped at les Sarziers so that the patriarch could show them ‘our’ house, where he was born. The inverted commas are because we have always felt that we are simply custodians of a place which has had a long history before we came, and will probably continue its life long after we are gone. Over the years various people have shown up and told us about their memories, living here as the children of tenant farmers. In this way we have learned about the animals they kept, the crops and vegetables they grew, how the water supply worked, and how hard it was making a living on poor, dry soil, enduring long freezing winters and baking hot summers. This family were delightful, and so grateful to be shown around. Michel had lived here for just one year, from 1939 to 1940 when he was sent away to be brought up by a relative as the family had grown too large for the farm to sustain all of them. He told us that he came back to visit his parents from time to time and showed us photos of himself as a toddler sitting on a rug in the courtyard with a sibling. He remembered the wine barrels in the big cellar and was delighted that they are still in situ (although unfortunately now empty!) We have long wondered who was the Marius who carved his name into the kitchen window sill, and it turns out that it was his uncle, who worked locally as a builder. 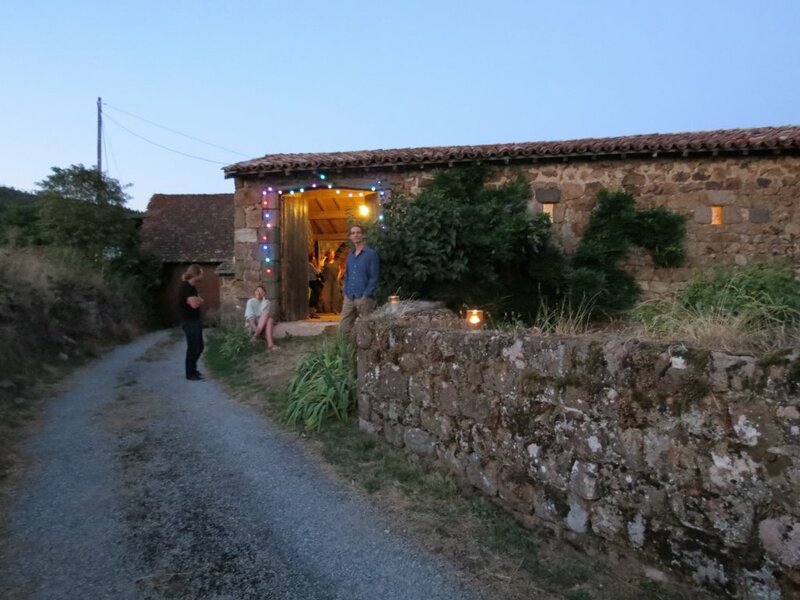 It was a lovely visit, and he thanked us with a gift of a bottle of vin de noix and reproductions of a little watercolour painting that he had made of the house. Just a few weeks ago, at the reception after Carla’s concert, I got talking to a lady I had met just once at a friend’s house, who worked as a district nurse here in the 1960’s, braving the twisty lanes in all weathers in her 2CV. I could see that she was very struck to find herself in our kitchen, and she asked me if I knew anything about the last people to live here before us. Indeed we do know that the family left after a tragedy – first the father died and then the son fell ill with terminal cancer. It all came back to her then, it was she who had come daily to care for him in his last months. I showed her his room and she gazed around, her eyes full of memories, it was a very moving moment. On a cheerier note – the widow and daughter moved only a little way away, down closer to the river, where the family still owns a little land, on which the daughter has a mobile home. Years ago she stopped and asked to have a look at the house and garden and told us that what she loved most was the little medlar tree which grew by the Doghouse, she even confessed that in the winter, when the fruit had bletted, she sometimes came up and picked some if we weren’t here. We told her of course that that was fine, but after she had gone we were left in a quandary. The medlar tree was seriously in the way of plans we had to reorganise, but now we simply could not cut it down as we had intended, without planting another somewhere else! We hastily bought a sturdy specimen and installed it under the garden wall where it continues to thrive, producing masses of fruit every year. Personally I’m not a big fan of medlars, so I do hope she still comes up foraging for some in the winter! It is now 30 years since we bought Les Sarziers and we definitely feel our roots growing deeper into the Ardèche soil. Let’s not be mistaken: will we never be “des gens d’ici”. For that, your family name, if it doesn’t do double duty as the name of your farm or hamlet and if it has not been inscribed on the village war memorial, must appear on a headstone in the cemetery – a privilege which we luckily don’t yet share with the villagers. But just now I’m not concerned with those sorts of roots. I mean the roots of our horse chestnut tree, which gives us welcome shade in the summer, sticky buds in the spring (that stick to the soles of your shoes and then leave traces all over the floors) and hundreds of conkers to pick up in the autumn. Since the 1930’s these roots have quietly travelled underground over a distance far greater than the expanse of its branches. This does not matter until they start finding their way into pipes. How they managed to break into a sealed PVC pipe we do not know, on the other hand we do know about the results. Of course it all started with a blocked outflow pipe, followed by unpleasant manoeuvres involving buckets in the cellar. The local plumber comes with a high pressure hose and solves the problem – but only temporarily. The pipe blocks again and the specialists come with a bigger and better hose. It blocks again. They return with a camera that must have been designed to explore a dinosaur’s intestines. And there we met the roots – underneath and smack in the centre of our tiled terrace. “We’ll need to have those up”, the plumber announced with relish (and of course in French, but it sounds just the same). As we could not bear the idea of demolishing our beautiful old tiles we decided to re-route the outflow pipe altogether: a dreary and expensive job but with the bonus of being able to link up the system with last year’s work in the stables. … and who do I meet there? The good old roots, at least 30 yards from the trunk, two inches thick and two feet down, turning neatly round the corners and happily spreading far and wide.
. . . which was enough of a challenge, so this time we were looking for a specialist. I chanced to encounter Emmanuelle in the boulangerie when I went to get the bread one morning. She was having a cup of coffee, and joined in with the general chat, even though she lives in the wilds above Empurany and has only been here for a year and a half (see above). She was there to drop of cards advertising the lopping, pruning and tree surgery services which she and her partner Johan offer. Voilà! They popped round one evening to take a look at the tree and a couple of days later Johan was perched on a rope assessing and sawing with the grace and artistry of an acrobat combined with the expertise of a surgeon. He told us that he started out as a cordiste in Marseille, but, although the word conjours images of steeplejacks mending church bell-towers or hanging daringly from suspension bridges as they work, he said drily that “there were an awful lot of windows to clean” and that it became boring. So the couple, with their little boy, relocated to the country. Both trained in tree surgery, they have found the perfect solution in a job and surroundings which they love and which provides endless interest and fascination. As Johan said, working on a complex living structure is both challenging and rewarding and the care with which he shaped our tree was impressive. All in all a genuine case of root and branch reform! A short history of wheelbarrows . . . In between two episodes of Kate’s silk stories here is a short interlude. The protagonist is this rusty wheelbarrow that has been helping us right from the moment we bought Les Sarziers with all the big jobs. It has transported cement bags, sand and gravel, stones, tiles and – in the garden – plant prunings, leaves, manure and compost. And last week, like the autumn before, it helped us storing our fire wood. Last year’s log pile was starting to diminish as for the last two weeks the evenings have become autumnal and the nights longer and we started up our two wood burning stoves. Our neighbour Roger’s nephew Dorian brought round a couple of tons last week, cut and split from timber that he had felled in the little wood below our garden, just as Roger used to do before he was reduced to crutches. As we loaded the first of them into the wheelbarrow, Dorian stopped for a moment and bent over to look at the wheel. “Solid rubber? Haven’t seen one like this before.” I tried to explain – but utterly failed – why this is a special wheelbarrow, which started its life in Paris in 1980. Well, since you ask …. below is a picture to prove its early glory. Dorian won’t be interested, but perhaps some of the readers of this blog might be intrigued or even remember. It was our first show with our Theatre/Dance Company Reflux performed in the Théâtre de la Plaine in the winter of 1981. The show was called “Kaleidoscope” and as you can see, the wheelbarrow had a starring role – just don’t ask what the hell we were doing. Later, for the more challenging building jobs we bought another wheelbarrow – a boring standard type with blow-up tyres. It is still with us, but has had already several punctures and is NOT orange. Here are some archive pictures of it in action, and as long as we have the strength to push it it will continue to be with us. Leaving our personal memories aside, isn’t the wheelbarrow one of the cleverest inventions of human kind? I just wish sometimes it had three more wheels and an engine! A few photos of the transformation in the stables. We’re already daydreaming about possible concerts, dining opportunities …. who knows!! We were expecting a hectic October and my goodness we have not been disappointed! The month kicked off with a great Walksweek. We hosted a lovely couple from Canada who were lucky with wonderful autumn weather and enjoyed glorious walking, a trip on the vélorail, picnicking by the Doux and a special peep into the wine making in progress in the Morlanche cellars. They could hardly have imagined what was about to unfold as soon as they had left! We had carefully scheduled three successive professional renovation jobs, on the kitchen and the stable, but first we needed to take care of all the preparation. 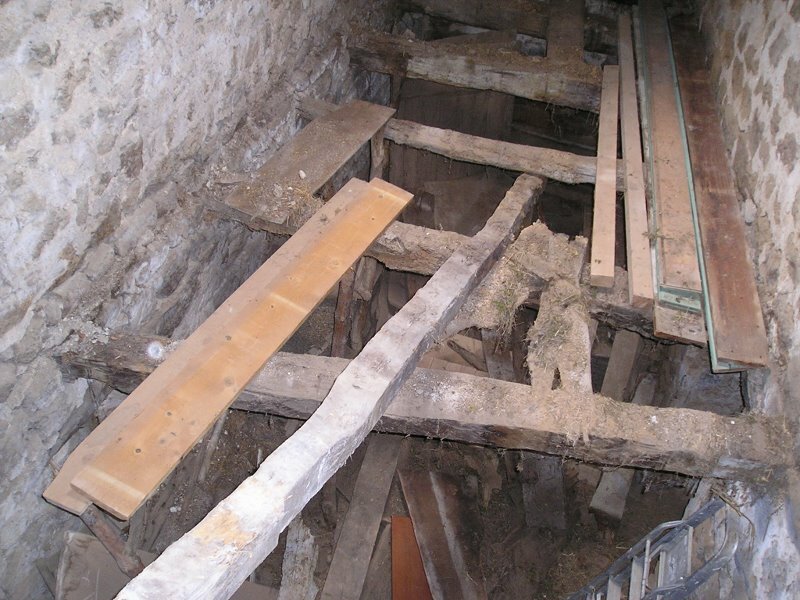 We started by getting stuck in to clearing centuries of junk, beams, stones, straw and unmentionables out of the stable prior to the laying of a concrete floor. Next we attacked the kitchen. We have decided that we are tired of living in a museum: the soot of ages has to go from the ceiling and the fireplace needs to be plastered. 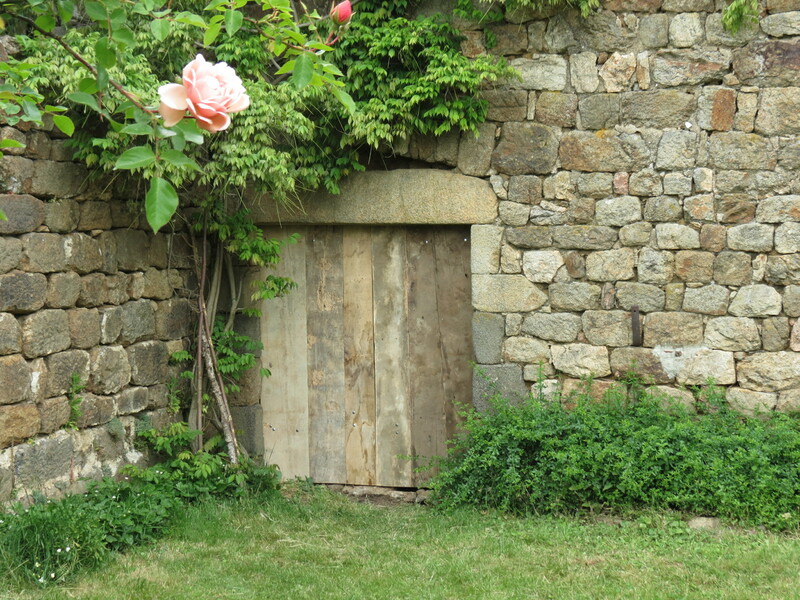 Inspired by the results in Patricia’s amazing renovation project at her chateau of Hautségur, we decided to go for Aérogommage, a less aggressive technique than sand blasting. It uses much finer particles and much more air, at lower pressure, so the result is spectacular, as you can see from Patricia’s blog. But of course there is also a fantastic amount of fine dust, so everything had to be cleared out or protected. Then everything started to happen at once. 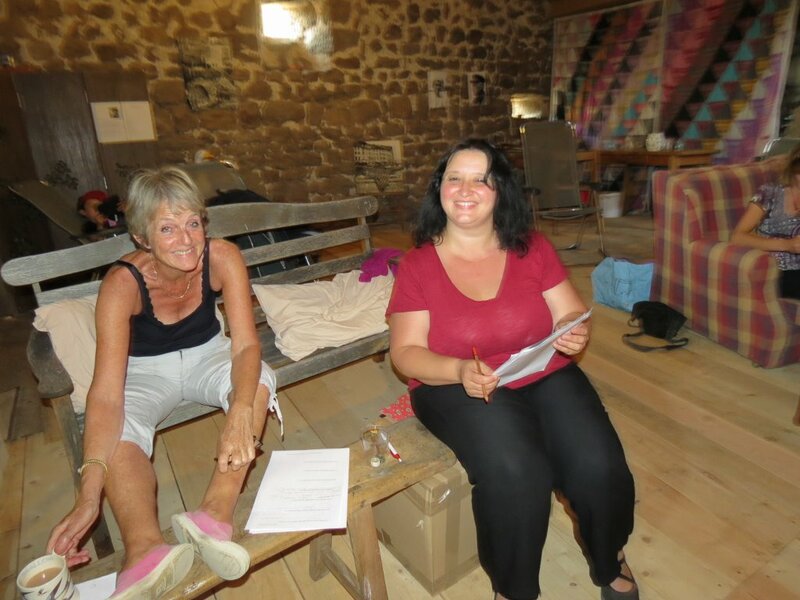 It began to rain – just what the construction team had been waiting for – and they went into action in the stable …..
whilst Emmanuelle and Philippe got to work on the beams. but the ceiling was starting to look good! The next day . . . wow! The builders disappeared, as builders do (the sun had come out again) and it was time for Daniel to plaster the fireplace. Unfortunately we have no pictures of him at work, but once again he did a fabulous job. We chose this family firm from Lamastre to plaster the inside of the house 25 years ago because, given their Italian family name, Avandetto, we were sure they would do a good job! The business was begun by Daniel’s grandfather, who came to the Ardèche in the 1920’s, to get away from the ascendency of Mussolini’s fascists in his native Turin, where the family had been bronze workers, specialised in creating equestrian statues of the Savoy monarchs to adorn the city’s squares. Then the heavens opened and the heavies were back! 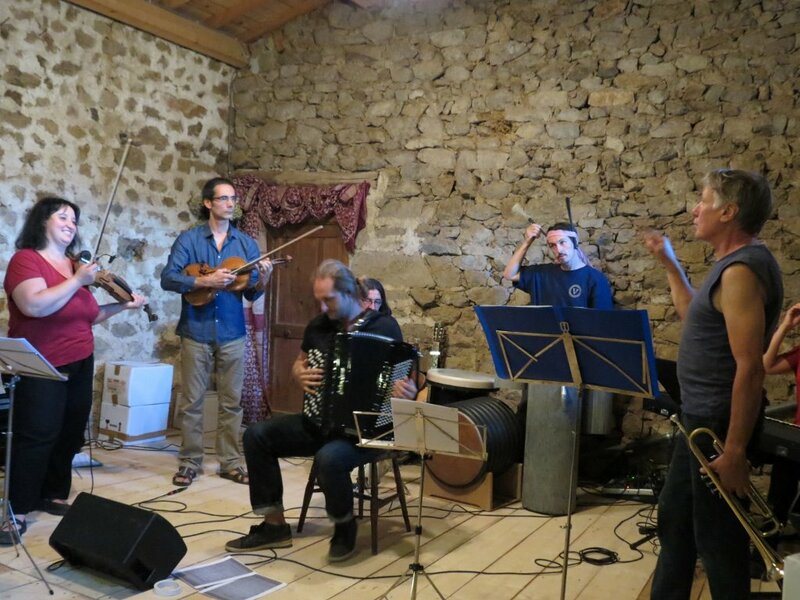 After days of rock breaking and jack hammering, finally everything was ready for La Toupie …. which arrived at 7 sharp this morning. It took until around 10.30 to get the floor laid and the guys are coming back intermittently throughout the day to “passer l’helicoptère” or surfacing machine. We still have a way to go, but we’re getting there! And meanwhile the trees are into full autumn swing and the countryside is beautiful. 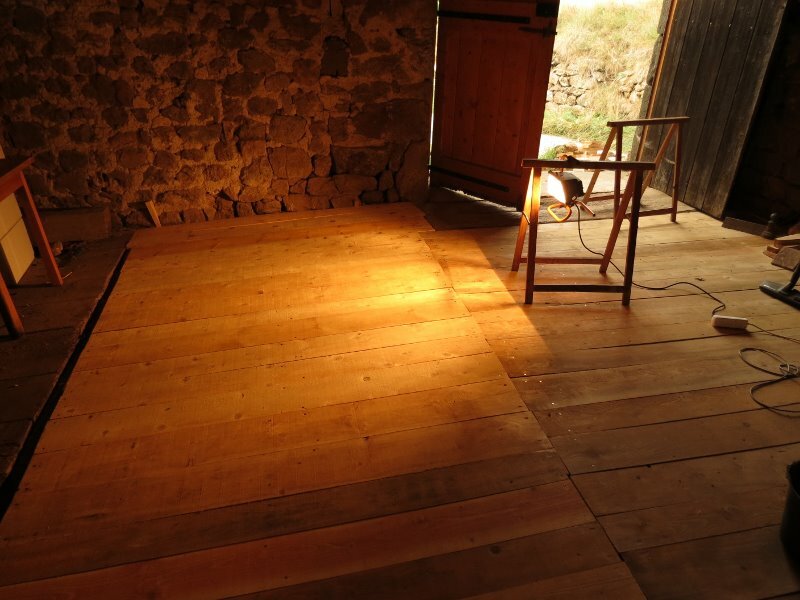 Assiduous readers of this blog will recall that last year we demolished the rotten barn floor and put in a new one. In the backs of our minds we had the idea of creating an indoor space in case of bad weather for our annual concert, but of course very soon the barn was once again filled with paint pots, matresses, circular saws, old doors and stuff in boxes from Paris, all coated in the usual dust and cobwebs. Added to which the birds had no intention of changing their habits and continued to build nests, for which they seem to need a lorry load of moss, most of which they drop inconsiderately over everything beneath their flight path. So in a way it was a relief that the weather was gorgeous for the concert with Toss the Feathers on August 7th. 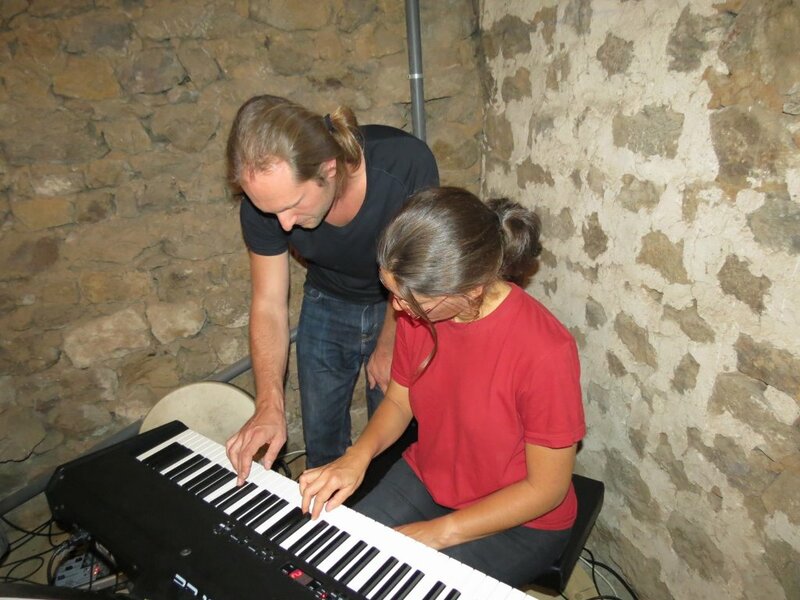 But somehow we were frustrated not to be able to inaugurate the place, so we decided to hold last Friday’s music workshop in the barn – and as it culminated in an open concert we took advantage of the occasion to set up an exhibition of photos by Markus’s godfather. After a week of clearing up and cleaning up, we were finally ready to hang a selection of photos and prepare a catalogue. The musicians arrived for lunch . . .
Then they got down to thrashing out the repertoire . . .
Jazz to Folk is pretty challenging . . . .
and there’s a lot to keep in your head . . .
After dinner in the kitchen, the saxophonist finally arrives . . . 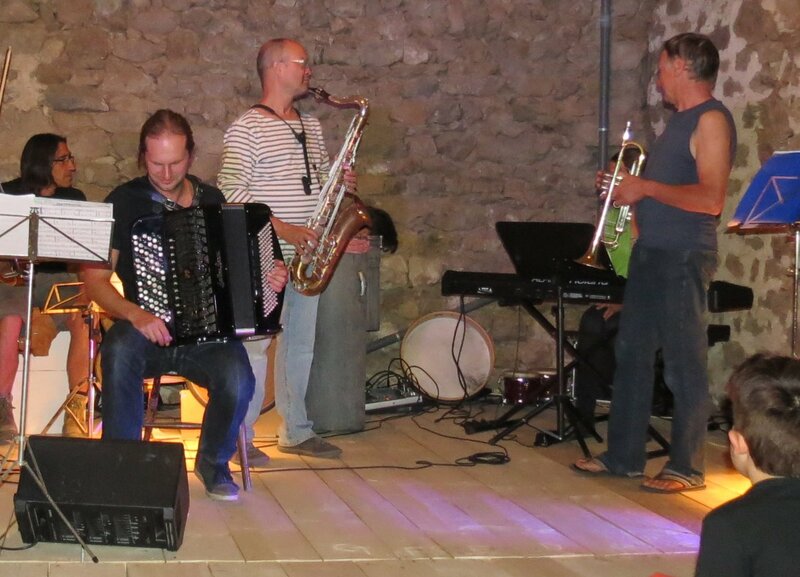 The summer was not all jazz and junketing. 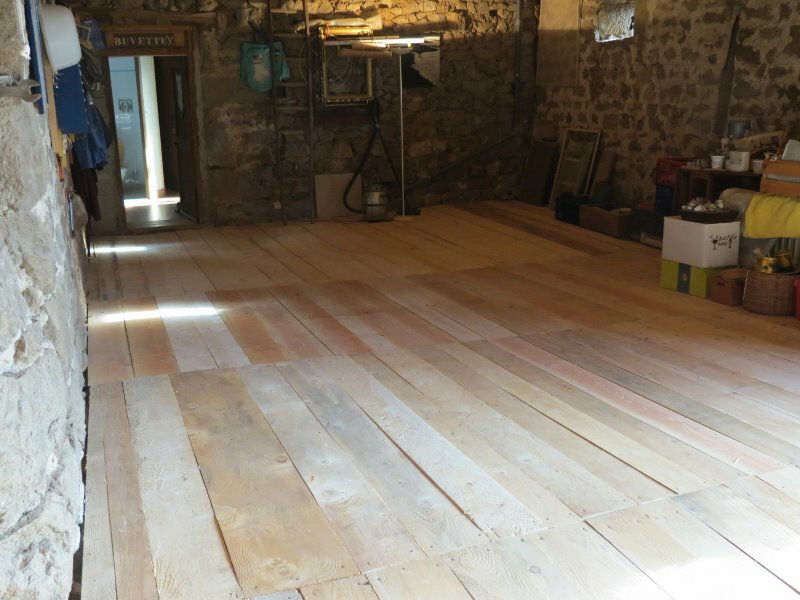 Inspired by the burst of activity on the barn in May we thought we really ought to continue replacing the worst sections of the floor. 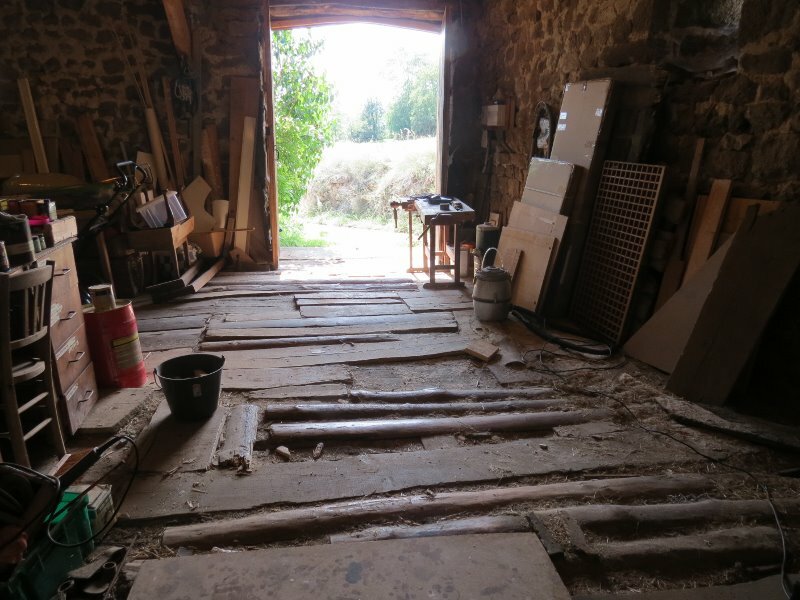 We made a second trip, this time with a slightly larger trailer, to M Sovignet at the sawmill in St Félicien to pick up more planks and having made most of the floor safe we called a temporary halt to operations. We sawed up and stacked all the old boards, which will keep us warm this winter, cleared a space in the stable to store them and thought we’d leave it at that for the time being. But this sort of job is a little bit like picking flowers in a wood: there are always a few more lovely ones just a little further on . . . and you end up as Red Riding Hood! The next section was rather more challenging since the beams were very widely spaced and uneven. It was at this point that, despite our endless admonishments to each other to be careful, Markus fell through into the stable, unfortunately landing on an arcane bit of agricultural kit rather than on straw and ancient manure! He was very lucky not to be more badly hurt and got away with just a few visits to the local physiotherapist who is as effective as she is charming. Having done so much it seemed silly not to go on and finish the whole job and before long Markus was taking careful measurements and making calculations on spare bits of board. We borrowed an even larger trailer and set off again for the sawmill. We first met M Sovignet years ago when we were negotiating floor boards for the house. A tall man, he was standing, dramatically silhouetted against a stormy sky, on a pile of tree trunks with a massive chainsaw hanging from his hand. He looked formidable, but turned out to be charming. We knew his father and they have the same ironic but basically optimistic view of life. M Sovignet père was apt to remark, when some natural or unnatural disaster was under discussion “Il y a bien longtemps que le monde il tourne”, implying that the world keeps rotating no matter what. His son has enlarged the family business considerably but he always has time for a friendly chat and treats our orders a seriously as if he were supplying a major contractor with the roof timbers for an entire housing development. We loaded up again and made multiple trips back to les Sarziers. The job proceeded steadily and we impressed ourselves by replacing a further two beams without mishap. Kate was employed in cleaning and nailing (we used kilos of nails) and Markus’s measuring skills proved impressive – we used up almost every scrap of timber that we had ordered for the job. The transformation of the barn has been spectacular and we feel that we have acquired a whole new useable space. Certainly the floor, although now level, still has a noticeable slope on it since the whole house and barn were originally built that way. But from the outset we did not propose to do a major demolition job but rather to make a structural and practical floor. And there is an upside . . . we now have a great space for bad weather concerts, with a raked seating area for the audience! 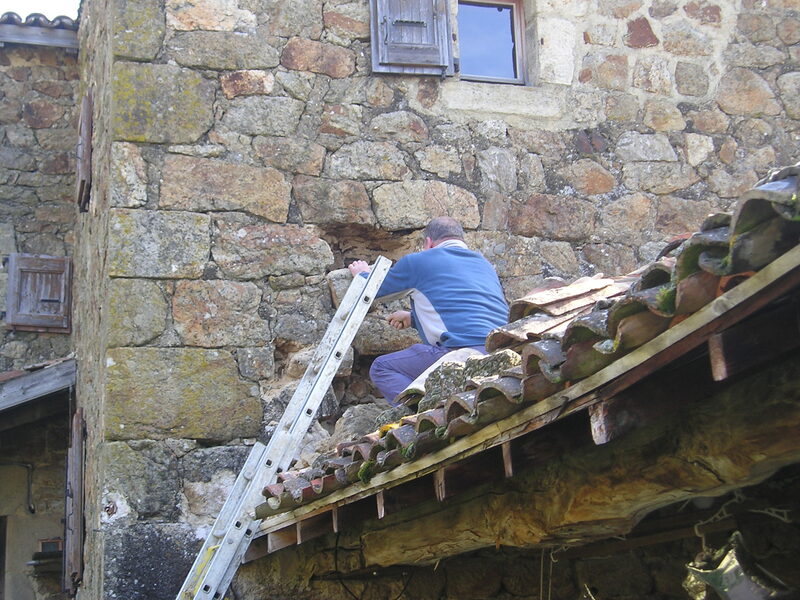 In the early days of les Sarziers we imagined a steady stream of visitors coming to enjoy the rural life for a bit and incidentally giving us a hand with the restoration work. We pictured industrious sunny days during which our ruin would slowly emerge from its chrysalis of neglect and reveal itself as the gorgeous butterfly of our dreams. The reality of course was somewhat different. We soon realised that guests understandably prefer a minimum in the way of running water, windows and electricity and that not everyone wants to spend their country holiday making concrete. should have kept those shoulders down! We slowly came to appreciate the enormity of the task we had set ourselves as we spent weeks at a time battling electric cables through walls four feet thick, exchanging massive beams, laying floors, plumbing, plastering, tiling and so on, and all apparently to very little effect, so huge was the project we had undertaken. We are now immensely proud of what we have achieved but it took much longer and much more effort than we could ever have imagined and the weather was often very far from what we had pictured in our early flush of idealism. shifting concrete – the hard way! But this is not to say that we had no help from our friends. 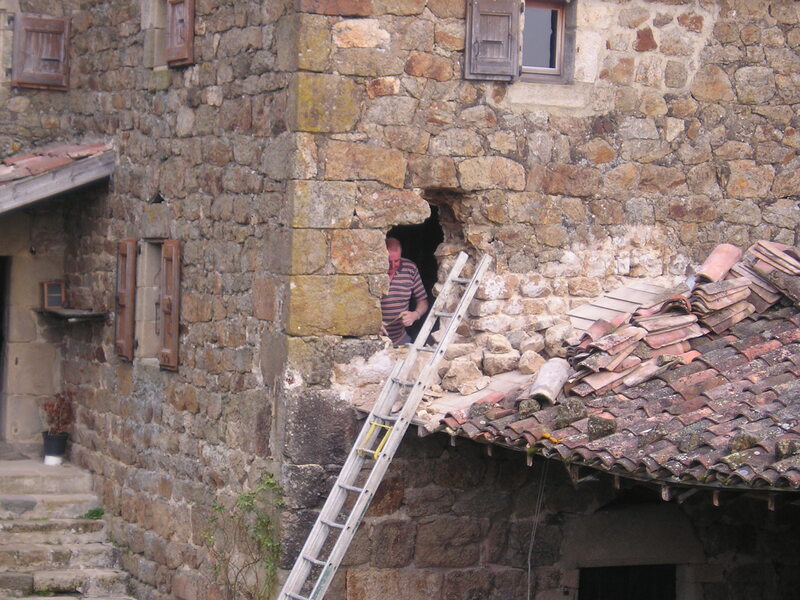 Sometimes it was more enthusiastic than truly helpful as on the occasion when we had popped into Lamastre to buy a kilo of nails and returned to find that our guests had demolished their bedroom ceiling because they thought “it looked a bit old”!! But many people did chip in with both restoration work and general advice and encouragement which kept us going over the years. However if it were not for our friends Jane and John, we would still be squatting in a building site! We would have no bedroom floor if they and their children had not spent one summer throwing the old one out of the window, (crying “timber” as they did so) and then replacing it. The staircase would still be a jigsaw puzzle of perilous boards, the pink room would neither be a room nor pink . . . the list is endless. Recently they spent a week with us on their way back from Italy and after a few days John was clearly getting restless. He and Markus went and had a serious look at the barn. We need more storage space and the beams and floor above the rear stable were definitely looking ropey. Serious discussion followed the inspection. Something had to be done. 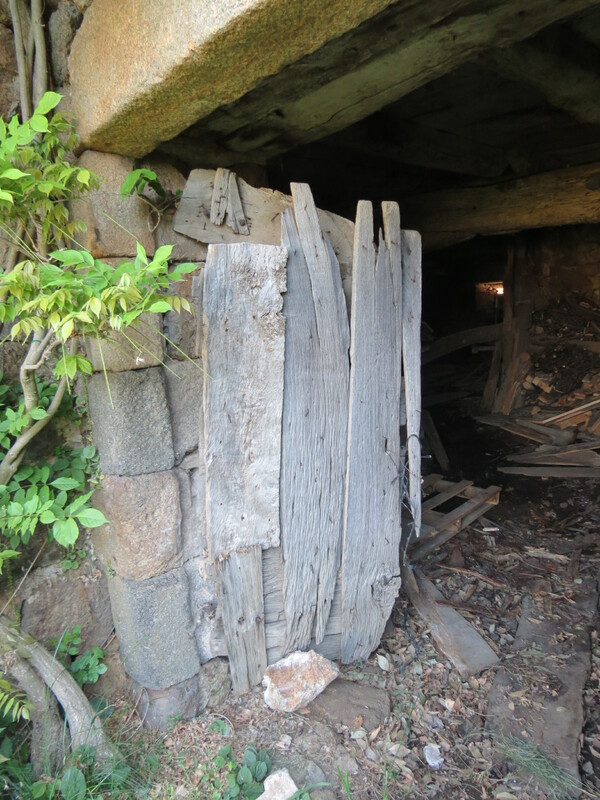 Two days later the old boards were out, the rotten beams replaced and we took a trip to the sawmill to order new timber. Sadly the boards would only be ready after John had left and although he seemed tempted to change his train ticket, wiser counsels prevailed. Nothing daunted he and Markus attacked another project which, as you can see was very necessary, but rather far down our to-do list. Et voilà! 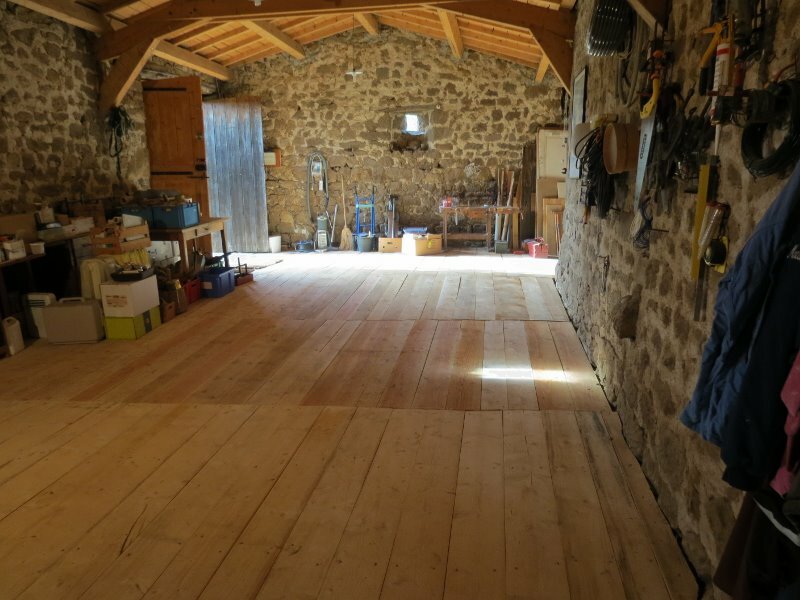 By the next day he had constructed a new stable door for us which is not only beautiful and functional but, in a very satisfactory manner, is made out of planks salvaged from the barn floor. John is used to massive undertakings, having restored his property Treowen which he now manages (click here to get an idea). 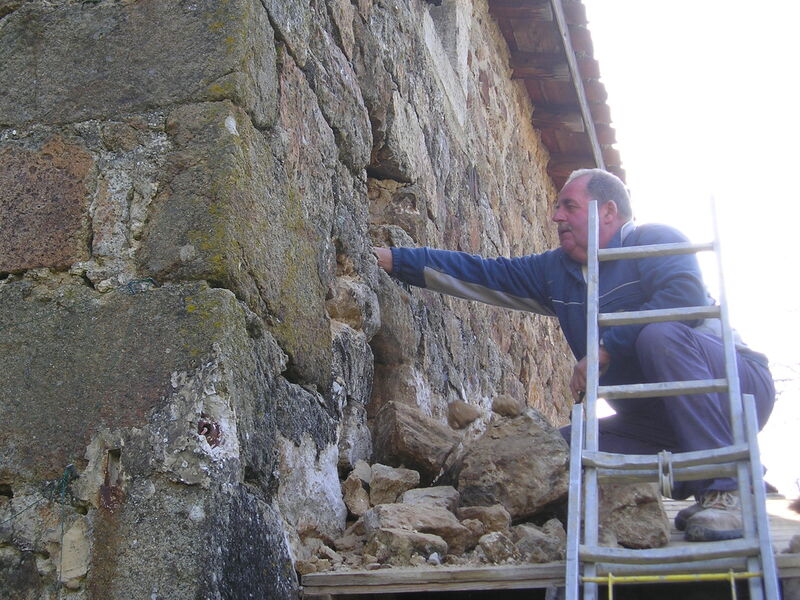 His advice and expertise have contributed enormously to our own restoration project. Merci infiniment! His last name is Morfin – very common around here – and the hamlet where he lives bears the same name: les Morfins. So we suppose he is Monsieur Morfin des Morfins, which sounds rather grand, and his cousins are variously Morfin-au-fond de-la-Place, who runs a garage, Morfin-ceux-de-la-Mouna, the suffix being the the name of their farm, and so on. Years ago the chap who worked on our roof was named Sarzier and it’s nice to feel that sort of continuity in an area. In fact we are sometimes referred to as ceux-des-Sarziers (those people from les Sarziers) which we take as a compliment. Markus’s un-spellable and un-pronounceable surname is a corruption of those people from the top of the mountain and mine derives from weavers, but these associations seem very distant from our lives today. We like feeling this attachment to a place which we have adopted and which perhaps, to a small degree, has adopted us.